In Haunted Buenos Aires part two, we present some of the distinctive bedeviled private properties in the city, just in time for Halloween. Luca Proden, a famous Italian rock star from the Argentine band Sumo, is said to haunt his former home in Monserrat. The rock star died in 1987, six years after moving to Argentina in an effort to kick his heroin addiction. Prodan became a successful musician here and managed to rid himself of his heroin habit, but developed a penchant for gin instead and died at the young age of 34 of cirrhosis of the liver. One of the oldest buildings in the city, Prodan’s old abode is now a bar called Lo de Luca. 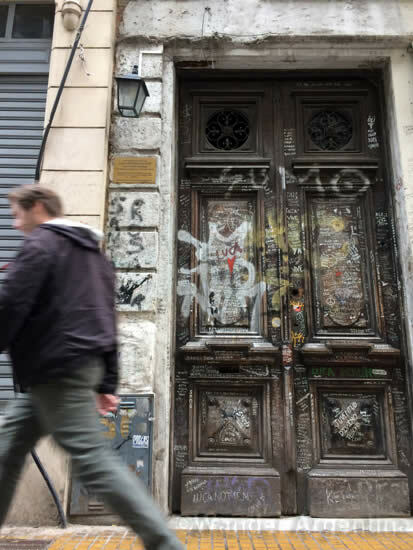 The building sat empty after Prodan’s death in 1987, until it was restored and declared a Cultural Site of Interest by the city legislator in 2007 in a bizarre event that included then mayor-Mauricio Macri coming face-to-face with criticism from Prodan’s brother, Andrea. Ramiro, one of the owners, reported hearing strange sounds and feeling cold drafts during the three years in which he oversaw the restoration. He decided to keep the room where Prodan died in its original state and sealed it off from visitors out of respect to the spirit of one of Argentina’s most beloved rockers. For his part, Prodan, who claimed to be clairvoyant, had mentioned to the press many times while still alive that paranormal activity took place in this residence. He said he heard chains being scraped across the floor and felt shadowy figures lurking in the corners. The comments were written off and attributed to too much gin by journalists and the public, but twenty years later when workers entered the previously sealed-off basement, they discovered dungeon-like cells containing human skeletons dating back to the Colonial era. Visitors of the bar often buy a shot for the spirit of Luca to make sure nothing too creepy happens while they are there. The offering didn’t seem to work though, as the once-popular bar now only opens a few hours on Saturdays — the spirit of Luca apparently wants some peace. The Palacio de los Bichos, or ‘Animal Palace’ was constructed in 1910, during the eclectic period. It stands five-stories high with arched windows, numerous balconies, gargoyles, and animal statues, which give the building its name – ‘bichos‘ means small animals or bugs in Spanish. It’s said that an Italian royal named Raphael Giordano built the mansion as a wedding gift for his doted-upon daughter, Lucia who was studying to be a doctor. The couple was very in love and the parents hosted a large wedding party. But that night in 1911, tragedy struck. Giordano’s daughter and new son-in-law set off in their horse-drawn carriage in front of their guests. As the neighborhood was rural at that time, the streets were dark. As the couple headed away they didn’t realize they were on the railway tracks and were struck by a cargo train, which killed them instantly. Giordano, feeling cursed and wanting to escape the memory of that tragic night that took his only daughter, abandoned the mansion and fled back to his native land. During the many years in which the mansion sat abandoned, neighbors reported hearing music and the sounds of a wedding party whistling through the trees, glimpsing translucent silhouettes dancing in the garden, and – although the building did not have electricity — lights flickering inside the mansion. In the 1990s the building reopened and today the building is made up of luxury lofts, with a spa on the first floor. So far, none of the well-heeled residents have come forth to admit that their apartment is haunted but many of the neighbors say the building still elicits a spooky feeling. The spirit of a troubled painter named Clementina haunts one of La Boca’s most distinctive buildings, the Art Nouveau Torre del Fantasma, or ‘Ghost Tower.’ The artist had an ideal live-in studio in the tower’s stunning cupola. She painted feverishly day and night, until one day when, in an apparent rash decision, she threw herself from the top floor. Family members were baffled that she killed herself in such a dramatic fashion, as she did not appear to be depressed. Shortly before Clementina’s death, a newspaper photographer came to take photos of her work. When the photos were developed, after her death, they revealed orbs and otherworldly unexplained dark figures lurking in the background. Years later the building’s owner, María Luisa Auvert Aurnaud, came forth to confirm that evil forces occupy the building. As a successful landowner she had kept quiet about her belief that the spirits visible in the photos drove Clementina to her death. Not only would it be bad for business, but she feared people would believe she was crazy. The current resident says that he hears footsteps in the night and his belongings are moved around when no one is present, but luckily, he hasn’t been driven to suicide.